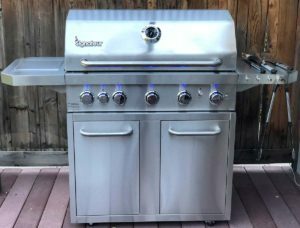 After our most recent purchase we decided we just have to give you a Costco Signateur Grill review. The Signateur 5-Burner barbecue grill is by far the best one we’ve ever owned. We’ve gone the route of the cheap Home Depot barbecue before and as usual, it rusted and fell apart after a year or two. This time we decided to go with something much higher quality, that will last a really long time. After mulling the options we decided on the Signateur at Costco (yes, very similar to Kirkland Signature, but we looked into it and it’s not the same company). It’s $599 in store and $749 online, which includes shipping. Considering this is 250 pounds it was very nice to have it shipped and delivered right to our backyard. Now let’s get into our review. First of all, this is a SOLID piece of metal. Our last barbecue was very flimsy and this definitely is not. We were quite impressed with the build quality. The manufacturer says they use 304 Stainless Steel, which is great because it won’t rust or corrode. Literally every piece of metal on this bbq is stainless steel, whereas less expensive bbqs tend to go cheap in some areas, and that’s where they usually fall apart. Even the grill grates are stainless steel, which is pretty rare on a bbq. They also say that it should last for at least 10 years. The best part is, if it does break down quicker than we’re expecting, Costco has a great return policy that we can use! So, we feel better about taking a slight risk on a lesser known brand knowing we can always return it if it’s not to satisfaction. We definitely don’t think we’ll have to do that though. We love the attention to detail, such as the winged bolt used to hold the propane tank snug in place in the slide out propane tray. And we were pretty surprised at how quickly the barbecue heated up. Within minutes it was already roaring at 500+ degrees (and the gauge goes up to 700!). Another attention to detail is the side hooks for hanging barbeque tools. You don’t really realize you’re missing it until you have it and it’s awesome. 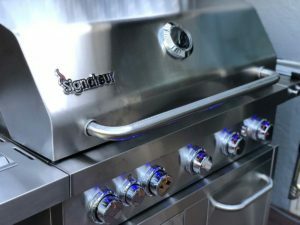 We had a few concerns before buying the Costco Signateur Grill but they were quickly put to rest after emailing their customer service email address. First of all, when buying a small brand grill you want to make sure you can get parts if you need them. The team at Signateur assured me that parts will be available. They told me Costco made them sign an agreement that they’ll have all parts available for the grill for at a minimum of 7 years after purchase. We also read through the reviews on Costco.com and were concerned about the knobs not turning. Just as customer service wrote in the response to the review on Costco’s website, you have to turn hard once to loosen and then it’s easy after that. With Father’s Day coming up this weekend this is a great gift for the Father/Dad in your life! We highly recommend it and have been so happy with our choice so far!